This past weekend was a ton of unexpected fun, even when doing the mundane. The broken spare tire rack on the bumper had been bothering Jim for a month, so this past Friday, Jim decided he had to deal with it. 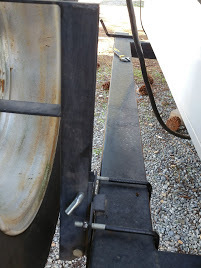 As a part of “dealing with it,” he and I made an impromptu trip to Little Rock – North Little Rock to be specific – to an RV service business that actually had a replacement rack. The one we had was too damaged to bother with it. Since we had reason to head that way and the truck was low on fuel, here was an opportunity to find a Kroger Fuel and take advantage of the soon-to-expire $1.00 per gallon fuel savings we had banked. Both errands, obtaining a tire rack and filling the truck at a huge discount, were successful. 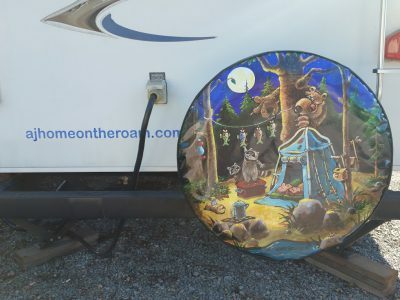 In fact, Jim became inspired to buy a new tire cover for the spare, especially since the old one got torn. I love the new one. We’d noticed a restaurant south of Batesville named the Southside Grill, so on the way back, Jim suggested we stop there to eat. 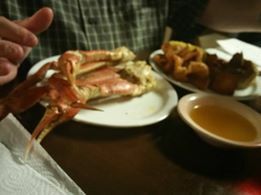 He was very happy with the choice because Friday night is an all-you-can-eat seafood buffet that could include crab legs for an additional fee. Jim really enjoyed his meal! I ate a BBQ stuffed baked potato. We both ordered dessert; his was to go though. Ever since we knew there was a good chance we’d be in Arkansas and I’d researched activities, curiosity has had me wanting to attend the 34th Annual Bean Festival and Outhouse Races in Mountain View . Saturday was beautiful, and Jim and I headed that way about mid-morning. It was our understanding the events began at noon, but that was bean eating followed by the Outhouse Parade and Races. We had NO clue how huge and fun of an event this would be. It was the complete opposite of the prior weekend’s visit to Bull Shoals (and the fun level was higher, too, though the Bull Shoals area is beautiful). Remember to click on photos, or at least hold your cursor over each, if you want to see the caption. There were rows and rows of vendors selling everything from homemade soap to handcrafted dishes to honey. Multiple live music venues were scattered over the downtown area. Food vendors abounded, and there was something for everyone from children’s activities to campaign booths. Heck, Billy the goat even walked around to greet everyone. Jim and I waited too long to get into line for beans and cornbread; they were out in less than an hour. That was okay as we had a very late breakfast at PJ’s Rainbow Cafe. We did enjoy walking around, shopping, listening to music, and watching the people, some outhouses as they arrived, the outhouse parade, and some of the races. After a fun-filled day in Mountain View, Jim and I returned home to care for Chewie and take a nap before heading to downtown Batesville to The Melba where we, along with a pretty big group of people, watched The Magnificent Seven. It was nice seeing this old but nicely renovated theater so full. You can read about the Melba here. Sunday was a lot more laid back, but Chewie had been feeling left out, so we loaded the boy into the truck and took him down to the River Walk in Batesville to get a good walk. Finding an additional walking trail meant that all of us were hot and tired when done. It was another exciting and fun weekend with each other while staying in Arkansas. Since we don’t know for sure how long we will be here, we try to make each weekend count!